mWater is a regulated open MAS that uses intelligent agents to manage a flexible water-right market. One of the main goals of mWater is to be used as a simulator to assist in decision-taking processes for policy makers. Our simulator focuses on demands and, in particular, on the type of regulatory (in terms of norms selection and agents behaviour), and market mechanisms that foster an efficient use of water while also trying to prevent conflicts among parties. mWater plays a vital role as it allows us to define different norms, agents behaviour and roles, and assess their impact in the market, thus enhancing the quality and applicability of its results as a decision support tool. mWater uses a multi-tier architecture, as indicated in the next Figure. 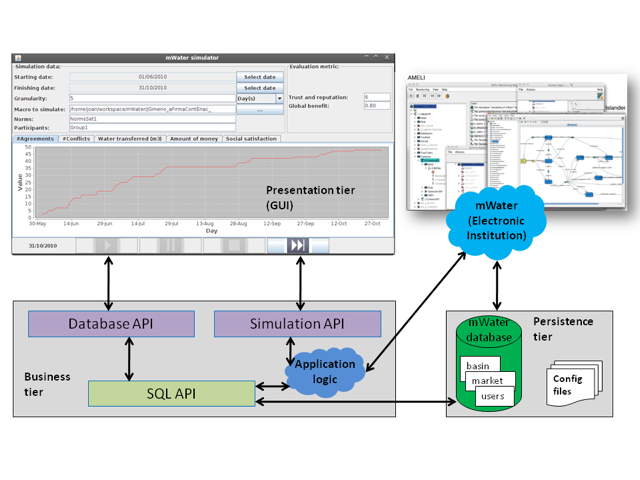 iv) deploying the GUI for simulation tool (presentation tier).